Moscow, 3 days before the kick-off of the World Cup Football Russia 2018 (June 14 to July 15), the former glory of Haitian football Philippe Vorbe entered the world football hall of fame on June 11, 2018, in Moscow (Russia), at the congress of the Confederation of North America, Central and Caribbean Football (Concacaf). Recently, on July 26, 2018, at a grand gala at the Hotel El Rancho, Régine Lamur, the resigning Minister of Youth and Sports paid a special tribute to the Dean of the Haitian Football Clubs, the "Violette Athletic Club". During the occasion, he honored the former captain of the national team, the legendary Philippe Vorbe. In an atmosphere full of emotions, many important personalities like former players, coaches, club leaders and those who have rubbed shoulders with this extraordinary former captain and footballer were present. Philippe Vorbe (born September 14, 1947) played for the Haiti national football team in the 1974 FIFA World Cup in Germany. He provided Emmanuel Sanon the pass that resulted in the famous goal that put an end to Italian goalkeeper Dino Zoff's no-goal streak. In February 1974, Hugh McIlvanney in 'Observer' described Vorbe as a "tall, handsome white man of French extraction" and a "graceful midfield player" with "impressive skills". 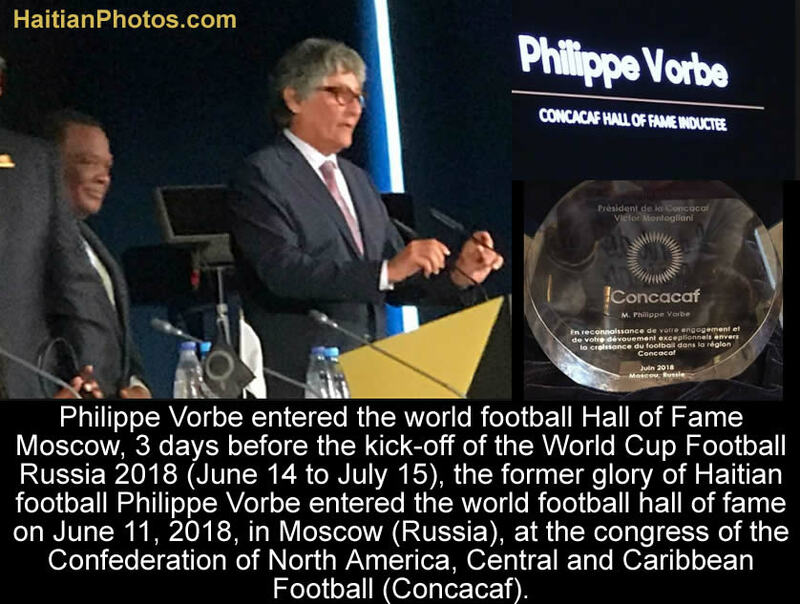 On June 11, 2018, at the congress of the Confederation of North America, Central and Caribbean Football (CONCACAF) during the World Cup tournament in Russia, Philippe Vorbe entered the World Football Hall of Fame. It is one of the greatest tributes to a football personality, a great first for any Haitian footballer. Minister Lamur introduced Philippe Vorbe as a model of success; he is a role model for aspiring Haitians-- Vorbe dedicated own career without any restraint for his passion, his dreams and everything for his love for country. On the plaque of honor awarded to Vorbe, there is an inscription: "President from the CONCACAF Victor Montagiliani, CONCACAF to Mr. Philippe Vorbe in recognition of your commitment and your exceptional dedication to the growth of football in the CONCACAF region ". Victor Montagiliani also assured of a rejuvenation of the club, the 'Violette', who had just celebrated his 100th birthday on May 15th.